This book Astanga Hrdaya: Sutra Sthana is first of its kind in the history of Ayurvedic literature which has been presented with a maximum number of illustration for better understanding the subject matter by the freshly joined students of Ayurveda. As a teacher of the concerned subject for the past 15 years the author has identified the necessity of proper study material in English language to cater the needs of 1st year BAMS students. Keeping this in view the author has made an attempt to incorporate the translation of the text along with the related matter compiled from other compendiums in the form of notes. 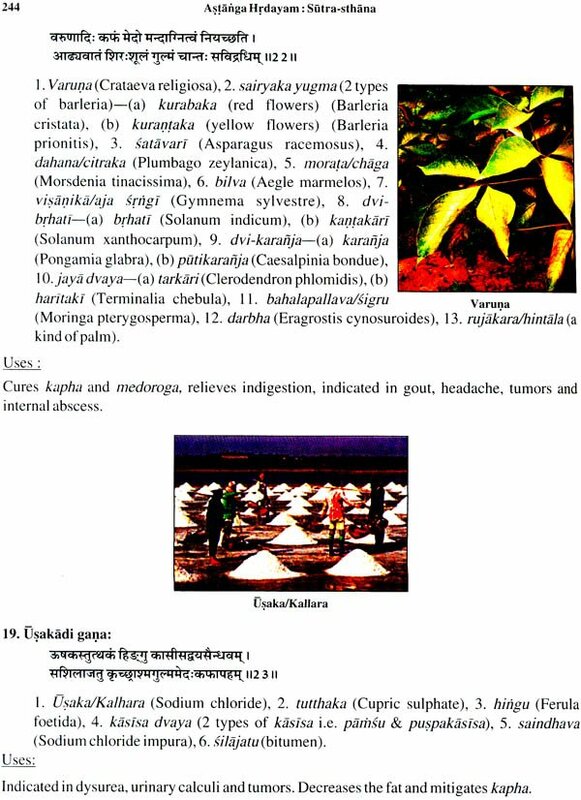 The book supplemented with annexure containing important essay and short question important slokas to be learnt by heart Alphabetical index of the herbs table of weights and measures glimpse of astanga hrdaya and glossary of Sanskrit terms. The present text book is primarily written for undergraduate students of ayurveda as per latest CCIM Syllabus 2012. However it is hoped that teacher PG scholars and general practitioners would find it useful as a reference book. Dr. R. Vidyanath, best teacher awardee for the year 2010 is currently working as PG professor and HOD Ayurveda Samhita at BRKR Govt. Ayurveda college Hyderabad. He has obtained his MD (Ayurveda) from Gujarat Ayurveda university Jamnagar and PhD form Dr. NTR university of health sciences Vijayawada. He had also undergone special training in Pancakaram from international institute of Ayurveda Coimbatore he served as a lecture asst. Professor and Professor at all the three government Ayurvedic colleges of Andhra Pradesh and complete 27 years of service. As an author as well as co author 15 books on Ayurveda were at his credit. He is a member board of studies Dr. NTR university of health sciences: examiner PG and UG courses and paper setter for various universities also a reviewer for peer reviewed journals. He has also presented more than 45 scientific papers at national and international seminars and published 27 Papers in reputed journals. Organized 5 ROTS, CME programmes and conducted more than produced Amruta Varshini a videocassette on Pancakarma a Ayurveda Hitopadesam an audiocassette on tenets of life. It was really a pleasure to review and to write a few words as foreword on the press copy of the book 'Astanga Hrdaya : Sutrasthana' authored by Dr. R. Vidyanath. The book comprises of the text and the translation with detailed comments and updated information on different aspects which are very useful for the present generation of readership today. 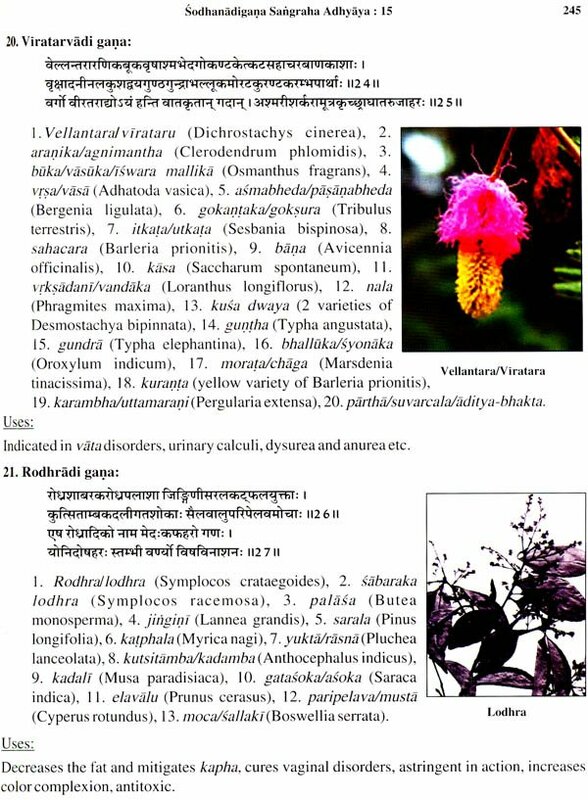 The efforts to add the botanical names and photographs of many medicinal plants to provide useful lead to correlate the same with the classical Sanskrit names are commendable. The designed diagrams of some surgical instruments and certain treatment procedures are really interesting particularly in the context of the study of a Samhita Grantha. This effort obviously adopts the message of Vagbhata himself who stated at the very outset of Astanga Sangraha, that this treatise is being created to make Ayurveda Sastra yuganurupa. The language of the write-up and the overall presentation of the book is easy to go through for a maiden reader. The entire approach appears critical and creative exercising adequate care to conserve the originality of the book and its contemporary readability. I hope this new addition to the contemporary Ayurvedic literature will benefit the students and teachers of Ayurveda in pursuing the subject in a right perspective. Astanga Hrdaya is an important classic text of great educational significance as it is prescribed as a text book for graduate students in view of its easy accessibility and because it is a better organized text than the Astanga Sangraha. The galaxy of Foundation texts of Ayurveda comprise of two sets of authentic texts fondly called 1. Brhattrayi and 2. Laghutrayi. Brhattrayi texts are 1. Caraka Samhita, 2. Susruta Samhita and 3. The Samhitas of Vagbhata (Sangraha and Hrdaya). Most often the Astanga Hrdaya is counted among the Brhattrayi, not so often the Astanga Sangraha. 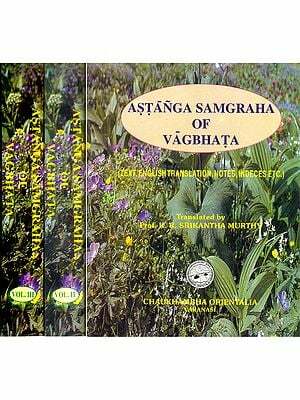 However many scholars believe that Astanga Sangraha is the prime text of Vagbhata. The Laghutrayi texts are 1. Madhava Nidana (900 AD), 2. Samgadhara Samhita (1300 AD) and 3. Bhavaprakasa (1600 AD). The historians consider the Brhattrayi texts, especially Caraka and Susruta, as the pre-Christian texts while Laghutrayi are the medieval texts. In Indian historical traditions there have been several scholars holding the name of Vagbhata. The famous Ayurvedic texts Astanga Sangraha and Astanga Hrdaya are also authored by the one or the other Vagbhata. Vagbhata represents the golden age of the Indian history, i.e. Gupta period and hence it gives a literary glimpse of the Ayurvedic tradition and cultural status of that period in India. There has been a controversy where the author of Astanga Sangraha and Astanga Hrdaya is the same I Vagbhata or they are two different persons. However, considering many facts, it is largely believed that they were two different persons and the two treatises were written in two different periods of history by two different authors. It seems Astanga Hrdaya was compiled by author later in order to make the subject more concise and easy to handle. The author of Astanga Sangraha is beloved to have greatest impact of Buddhism as is evident by author own omission to Buddha. The critical comparative study of the two text in term of the impact of earlier classics like Caraka and Susruta it is believed that Astanga Sangrah ahas more Caraka impact while Astanga Hrdaya carries an impact of susruta. The style and approach of the two text becomes obvious if one compares the depth and girth of the two texts. Astanga sangraha has 150 chapters nds AStanga hrdaya has 120 chapter displayed in different division as described in the following table which reflects the preferential inclusion and exclusion of the subject matter and the size of the text. I will be interesting to undertake a critical comparative study of all the samhitas in relation to the period of compilation and the reason of such differences. The sangraha and hrdaya texts of Vagbhata written dominantly in prose and poetry respectively representing a glimpse of the sastriya tendency of vibhaga vs samyoga vigraha vs sangraha and vistara vs samkepa. Astanga sangraha is the leading text of sangraha style which incorporates the subject matter from different Tantras and reproduces the same in a summarized form with greater clarity while Astanga Hrdaya adopts different style. Further it is obvious that ancient classics like caraka and susruta deliberated more on the fundamental and philosophic aspects of the subject while the later text diverted them from philosophy towards practical aspects. 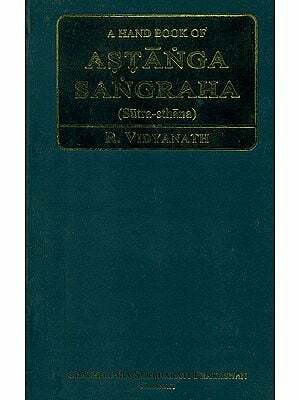 The present volume under publication by Dr. R. Vidyanath presently limits itself to the sustra sthana of Astanga Hrdaya which contains 30 chapters namely 1. Ayuskamiya, 2. Dinacarya, 3. Rtucarya, 4. Roganutpadaniya, 5. Drava-dravya Vijnaiya, 6. Annaswarupa Vijnaniya, 7. Annaraksa, 8. Matrasitrya, 9. Dravyadi Vijnaniya, 10. Rasabhediya, 11. Dosadi vijnaniya, 12. Dosabhediya, 13. Dosopakramaniya, 14. Dwividhopakramaniya, 15. Sodhanadi-gana sangraha, 16. Sneha-vidhi, 17. Sweda-videhi, 18. Vamana-virecana-vidhi, 19. Vasti-vidhi, 20. Nasya-vidhi, 21. Dhumapana-Vidhi, 22. Gandusadi-vidhi, 23. Ascotana-anjana-vidhi, 24. Tarpana-putapaka-vidhi, 25. Yantra-vidhi, 26. Sastra-vidhi, 27. Sirayadha-vidhi, 28. Salyaharana-vidhi, 29. Sastrakarma-vidhi, 30. Ksara-agnikarma-vidhi. Each of these 30 chapter have been presented in this volume with original Sanskrit text followed by descriptive interpretation and author reader friendly comments in a lucid style not caring critically about the mere literary translation. He follows an illustrated style of presentation taking help of a number of photographs and diagrams for the purpose of comparative study in the present day perspective especially about medicinal plants blunt and sharp surgical instruments and certain therapeutic. However the authenticity of these illustration will have to be validated and verified in subsequent edition of this book after input from the readers. Summarily this book is a student friendly scholarly work of great value. This is an important addition to the contemporary literature in Ayurveda. I have known the author of this book Dr. Vidyanath for many years. He is an erudite scholar of ayurveda and is an activist and an enthusiast in his field. I congratulated the author for his good work and with this publication a grand success. During the ancient times, Acaryas of Ayurveda had written voluminous works on different specialties, which were not tangible to mediocre students. So, the time demanded in writing concise books, which cover the essentials of all the eight branches of Ayurveda. Vagbhata was the first person who composed a treatise entitled Astanga Sangraha by bringing together the relevant medical knowledge contained in Caraka Samhita, Susruta Samhita, Harita Samhita, Bhela Samhita, Kasyapa Samhita etc. The author himself says "By churning the great ocean of medical science, a great store of nectar by name Astanga Sangraha was obtained. From that store of nectar, a short treatise entitled Astanga Hrdaya was written for the benefit of mediocre students". Acarya Vagbhata was the son of Simhagupta and the grandson of Vagbhata belongs to the region of river Sindhu. His fore fathers were also great scholars of Ayurveda. He was the disciple of Avalokita, the chief monk of Mahayana Buddhism. Basing on the internal and external evidences the date of Vagbhata can be fixed between 4th and 5th century AD. Astanga Hrdaya is one of the most celebrated and most often studied treatises on Indian Medicine, after Caraka Samhita and Susruta Samhita. The work significantly begins with an I aphoristic preface "What follows is what was said by great sages, Atreya and others." This work generally follows the general plan of Astanga Sangraha and divided into six sections, 120 chapters. The total number of verses is 7120 in the extant edition. Sutra sthana is the first section contains 30 chapters dealing with Basic principles of Ayurveda, preventive measures, diet and dietetics, classification of diseases and methods of treatments etc. Sarira Sthana is the second section contains 6 chapters dealing with embryology, anatomy, physiology, physical and psychological constitutions, auspicious and inauspicious dreams and omens, signs of bad prognosis etc. Nidana Sthana is the third section contains 16 chapters dealing with etiological factors, signs and symptoms, pathogenesis and prognosis of important diseases etc. Cikitse Sthana is the fourth section contains 22 chapters dealing with the line of treatment of various diseases including pathyapathya. Kalpa-Siddhi Sthens is the fifth section contains 6 chapters dealing with formulations and methods pertaining to elimination therapy, management of complications, principles of pharmacy etc. Uttara Tantra is the sixth section contains 40 chapters dealing with the remaining seven branches of Ayurveda. This work has as many as 37 commentaries, the largest number for any early medical classics. It has been translated into many languages viz. Tibetan, Arabic, German etc. In the Tibetan canon, Tangyur (8 AD) is included a translation of this work along with Caraka Sarnhita and Susrta Samhita. It was also translated in to Arabic about the same time under order from Baghdad Caliphs. Author translation was available into German, which was taken up by Luise Hilgenburg &amp;amp;amp;amp;amp; Wilibald Kirfel. The following is the list of commentaries available on Astanga Hrdaya either fully or partially. 1. Sarvanga sundara by Aruna Datta (1200 AD) was edited by Vijaya Ratna sena Gupta, Calcutta in the years 1888, and by Anna Mores wara kunte, Bombay in the year 1889.
press. Bombay in the year 1930. Only sutra Sthana of Astanga Hrdaya was prescribed by CCIM as a one of the subjects in the curriculum of BAMS course in the first profession. As one today sufficient number of Hindi as well as regional language translations are available in the market. As a teacher of the concerned subject for the past decade I have identified the necessity of proper study material in English language to cater the needs of freshly joined students of Ayurveda. Keeping this in view I have made an attempt to incorporate the translation of the text along with the related matter compiled from various resources in the form of notes. For a better comprehension, the book is supplemented with full of illustration. In the annexure the following material is incorporated. It may not be an exaggeration if I quote that this is the first illustrated book on Ayurveda Samhitas. 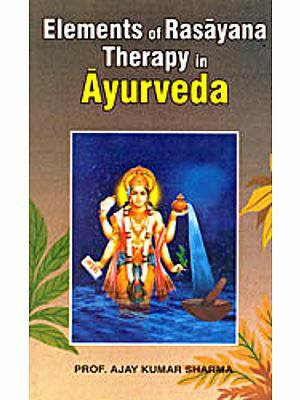 Through the present book is primarily written for undergraduate student of Ayurveda it is hoped that teacher P.G. scholars and general practitioner would also find it useful as a reference book. Keeping the latest CCIM syllabus 2012 in view, Maulika siddhanta part has also been incorporated at the end. At this juncture I am expressing the pure warm sweet and bright flame of gratefulness to my mother Mrs. Rajyalakshmi and to my father late Dr. R satyanarayanacharyulu. I record my thanks to my life partner Mrs. Padma Vani and my beloved son satya Teja for their unbounded affection and encouragement. Without whose infinite inspiration and co-operation I could not have completed this work so smoothly within the stipulated time. I am extremely grateful to my beloved guide revered preceptor versatile scholars Dr. K. Nishteswar, professor &amp;amp;amp;amp;amp;HOD dravyaguna, IPGT &amp;amp;amp;amp;amp; RA Gujarat Ayurveda university Jamnagar a versatile scholar and an experienced teacher of Kayacikitsa for his acceptance to pen the foreword. I would like to express my sincere thanks to all my teacher student and friend DR. K.V. Ramana Raj, Dr. C.N. Murthy, Dr. Ch. Ramakrishna, Dr. D.A.P. Reddy, Dr. S. Venkat, Dr. Sarvesh, Dr. B. Ramarao, Dr. P. Manohar, Dr. P. Gayatri Devi, Dr. N. Srilakshmi, Dr. D. Vijay Ganeswara Reddy &amp;amp;amp;amp;amp; Dr. K.J.L. Lavanya Lakshmi who helped me directly or indirectly for taking up this project. My special thanks are due to Dr. Mallu Prasad CCIM Member &amp;amp;amp;amp;amp; President, A.P. Ayurvedic Medical officers Association and Dr. G. Ramachandra Reddy, General Secretary, A.P. every phase of my service activities. At the end I wish to acknowledge my hear felt thanks to Mr. N.D. Gupta, Chaukhamba Surbharati Prakashan Varanasi for taking up the publication of this work.